So HDFS provides concepts like Replication Factor, High memory block size and it can scale out up to several 1000 nodes. Hadoop itself is distributed file system and it provides the features of the file system. 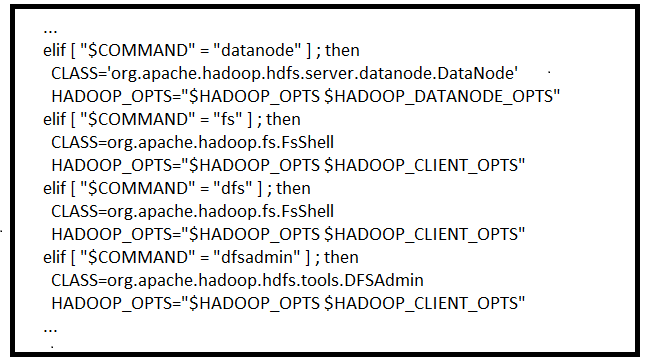 You can see the definitions of the two commands (Hadoop fs& Hadoop dfs) in $Hadoop_HOME/bin/Hadoop. You can see definitions of the two commands (hadoop fs& hadoop dfs) in $HADOOP_HOME/bin/hadoop. The File System(FS) shell includes various shell-like commands that directly interact with the Hadoop Distributed File System (HDFS) as well as other file systems that Hadoop supports, such as Local FS, HFTP FS, S3 FS, and others. The Hadoop File system uses the following commands to read, write and modify the data. These are shell based commands which are used by developers to communicate with the Hadoop file system. Append single source, or multiple sources from local file system to the destination file system. Also reads input from stdin and appends to destination file system. Change group association of files. The user must be the owner of files, or else a super user. Change the permissions of files. The user must be the owner of the file, or else a super user. Change the owner of files. The user must be a super user. Options :The -R option will make the change recursively through the directory structure. This command is very similar to put command except that the source is restricted to a local file reference. It is similar to the get command implementation. Limitation is that the destination is restricted to a local file reference. Copy files from source to destination. This command allows multiple sources as well. In that scenario, the destination must be a directory. Options: The -f option will overwrite the destination if it already exists. Takes a source directory and a destination file as input and concatenate files in src into the destination local file. Optionally addnl can be set to enable adding a newline character at the end of each file. Recursive version of ls. Similar to Unixls -R.
Takes path uri's as argument and creates directories. Options: The -p option behavior is much like Unixmkdir -p, creating parent directories along the path. Similar to put command, except that the source localsrc is deleted after it's copied. Displays a "Not implemented yet" message. Moves files from source to destination. This command allows multiple sources as well, but the destination needs to be a directory. Moving files across the file systems is not permitted. Copy single source or multiple sources from local file system to the destination file system. Also reads input from stdin and writes to the destination file system. Delete files specified as args. Only deletes non empty directory and files. If the -skipTrash option is specified, the trash, if enabled, will be bypassed and the specified file(s) will be deleted immediately. This can be useful when it is necessary to delete files from an over-quota directory. Refer to rmr for recursive deletes. Recursive version of delete. If the -skipTrash option is specified, the trash, if enabled, will be bypassed and the specified file(s) will be deleted immediately. This can be useful when it is necessary to delete files from an over-quota directory. The -e option will check to see if the file exists, returning 0 if true. The -z option will check to see if the file is zero length, returning 0 if true. The -d option will check to see if the path is directory, returning 0 if true. This commands checks entire file system and provides the below details by just providing the input path as argument.